Complete course with full content that can be easily customized. Source files included in the package. 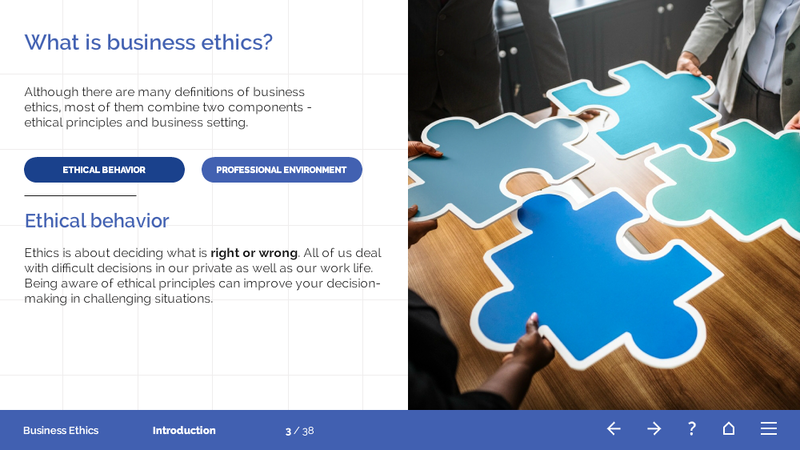 This training course is designed to provide an understanding of what is business ethics, how it could affect you in your working environment and how you can apply it in real life situations. 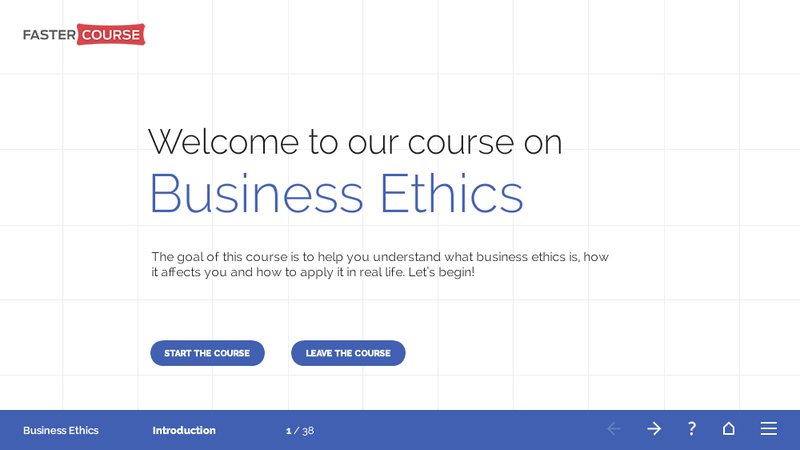 Theoretical information combined with practical examples that illustrate ethically challenging situations will help learner better understand all aspects of business ethics. 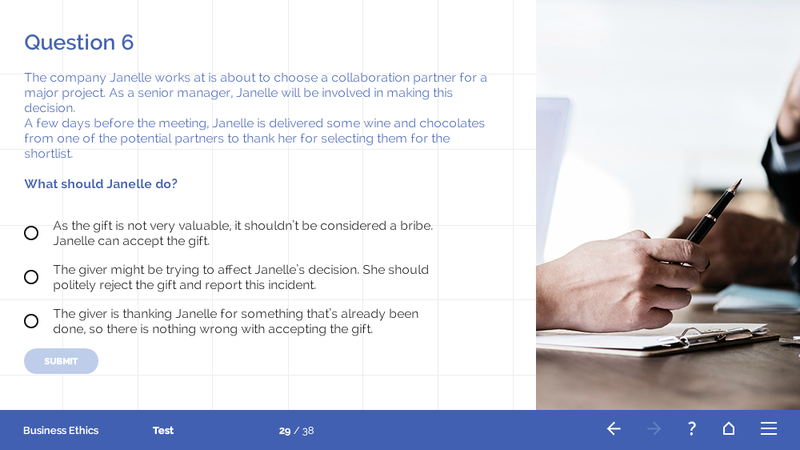 Tasks are created to allow them to practice ethical principles in different work-related situations. Click below to see a short demo! This e-learning course takes approximately 30 minutes to complete and consists of 38 pages and 5 modules. Built in Articulate Storyline 2 and Adobe Captivate 9, can be modified using Articulate Storyline 2, Articulate Storyline 3 or Articulate Storyline 360, as well as Adobe Captivate 9, Adobe Captivate 2017 and Adobe Captivate 2019. If you don’t own any licenses, we can adjust the content on your behalf. Can be published for SCORM, TinCan or HTML5. Will work on any LMS. 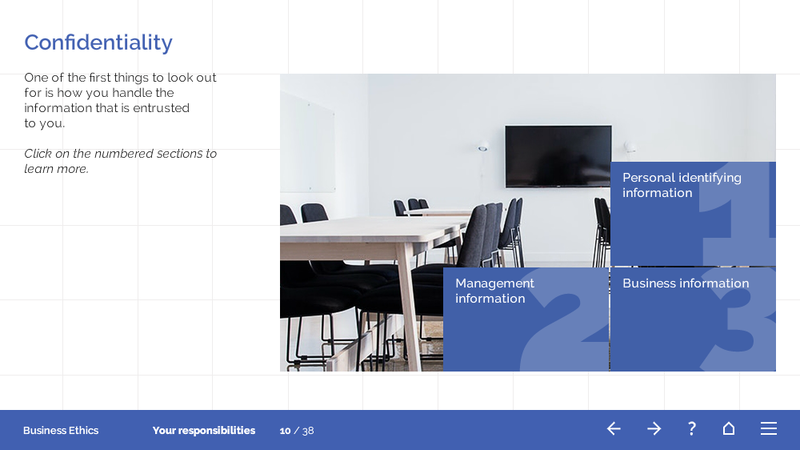 Captivate versions are fully responsive and are using Arial font. 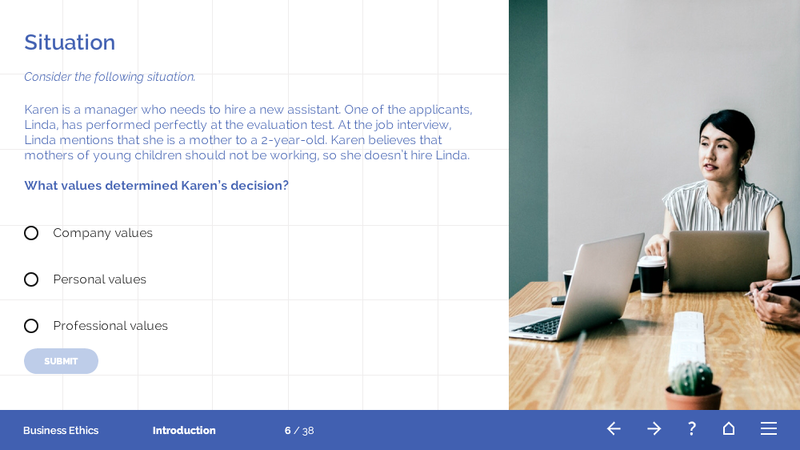 In Storyline courses we used Raleway font that can be downloaded for free from Google Fonts. Just imagine how much time and money this course will save you, everything is ready, but if you want you can delete parts which you don’t like, and add some content that is specific to your organization, you have the freedom to adjust the content any way you like. Deleting and adjusting usually takes less time than creating everything from scratch. Get this course for $499 or get 5 Customizable Courses for $1999!